Amber adores her new life, especially as she's falling in love for the first time too. But soon the glossy exterior starts to slip and Amber begins to wonder if she's made the right decision entering this world. Then a face from her past reappears and she finds herself in real trouble. With Christmas fast approaching, Amber is drifting further away from her loved ones. Can she get her life back on track before it's too late for a merry Christmas? 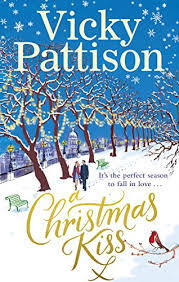 With such a pretty festive cover it was impossible not to stop everything and dive in to A Christmas Kiss by Vicky Pattison. I really enjoyed All that Glitters earlier in the year so I was looking forward to starting this one. Amber Raey has always had big dreams to become a great fashion designer and she was hoping that working as an assistant to Diana would give her a chance to break into the industry but she seems to be slaving away still at menial tasks and she is no closer to her dream. When a chance meeting with fashion designer Allesandro arises she is about to get a chance to shine and make it to the top. Amber soon finds out that life in the spot light is not all rosy when it attracts fame hungry people who put spanners in the works but can Amber keep her feet on the ground and also make a success of the career she longs to hold on to? This is such a fast paced exciting read that has Vicky Pattison’s voice sounding out through the pages! Full of glitz and glam and the troubles of being in the spot light this is something that Vicky Pattison knows all too well and she has poured this into this storyline. Amber is an extremely talented and determined character who has such a loving family to support her as well as encouraging friends too. There is a lot of humour as well as some deeper moments that will pull at the heart strings as Amber experiences many highs and lows along her journey making mistakes along the way and desperately wanting to right the wrongs she has made. My one little gripe is this book lacked the festivity I was hoping for after seeing such a promising cover and title, in truth this is a book that could be read all year around even on your next Summer holiday. This was another entertaining and witty easy read that has a sweet splash of romance for you to enjoy. Too bad it's not festive as the cover gives a feeling to it. I guess it's also marketing, as book was released recently, and now is the perfect time to buy books as Christmas presents.